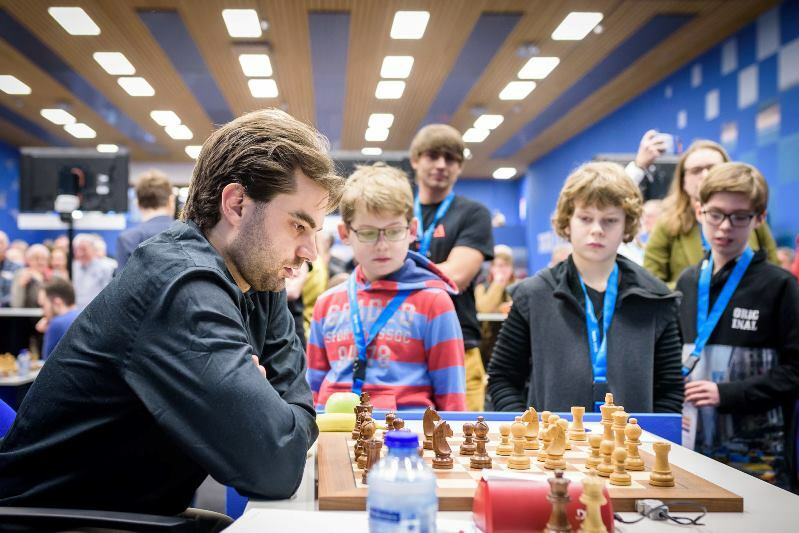 Sam Shankland resigned in a drawn position in Round 11 of the Tata Steel Masters, enabling Anish Giri to catch Magnus Carlsen with only two rounds to go. 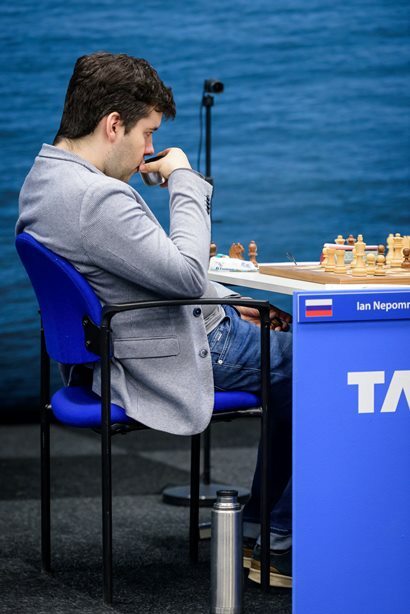 The other big result for the title race was Ian Nepomniachtchi beating Vladimir Fedoseev to move into clear second place. 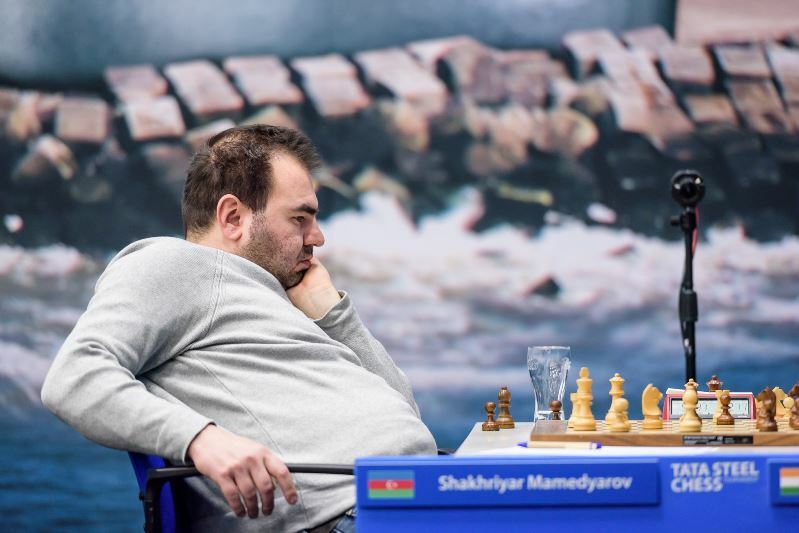 Vladimir Kramnik finally picked up his first win of the event against Jorden van Foreest, but Shakhriyar Mamedyarov is still winless and has plummeted out of the 2800 club and dropped to world no. 5 after losing to Vidit with the white pieces. Giri 1-0 Shankland: Did you resign? It was quite peculiar, because initially the endgame was of course equal, I didn’t think I’m playing for anything, and then he blundered into this position, and from his body language I realised he thinks he’s lost. But I thought it was a draw, so it was very difficult for me to behave, because on the one hand I wanted to think about the position and try to figure out if there is still a chance without going b6, but on the other hand I realised that there is probably none, and I thought after b6 he thinks he’s lost, so ok, I decided to give it a shot, and with a stone cold face I go b6, and then he extends his hand. Ok, I shake it, and to be sure ask, "did you resign?" He says, "yes". He had a hallucination, because he thought that since the king doesn’t get back to a8 it is not a draw, but there are many studies based on this trick. As long as you provoke b6 the king can stay on c8 and it’s a draw as well. He had a hallucination of some sort – it can happen. But it’s quite funny that the only way for him to lose is to resign, because if he wouldn’t have resigned I wouldn’t have been able to break through. Maybe Magnus Carlsen would, but I wouldn’t be able to! A nice psychological calculation by Anish… but obviously a very heart-breaking experience for Sam, one with which I’m quite intimately familiar, having resigned in drawn positions. Mainly the one game where I resigned in a completely drawn position was in Wijk, though I have done some other silly things as well. I have offered draws in winning positions. I know just how horrible of a feeling this is and I feel for Sam. This will be a very bitter pill to swallow for him. Some World Championship Challengers were watching! I skimmed through the book yesterday – it was quite an inspiration and I was thinking at several points during the game, “how would AlphaZero have approached this”, but then I thought, AlphaZero would have played f5-f4 and then very slowly tried to go g6 h5, and then I realised I’m not AlphaZero and made a draw! Magnus said he’s not afraid of me, so now I’m really depressed and I don’t know what to do with myself! I’m fighting for 90% of the tournament with some cold, so for me it’s a question of survival not winning the tournament…The main part is to survive! Today I think I played another bad game, but finally managed to win. The position was basically simply winning after some 20 moves and I made some absolutely ridiculous things and I had to try and win a slightly better endgame. Here I’m completely out of mind and I just cannot manage to play one decent game in a row. 20…Bxe4! was a heavy blow Shak seems to have missed, with the point being that 21.Rxe4? fails to 21…Qc6!, forking the two white rooks. 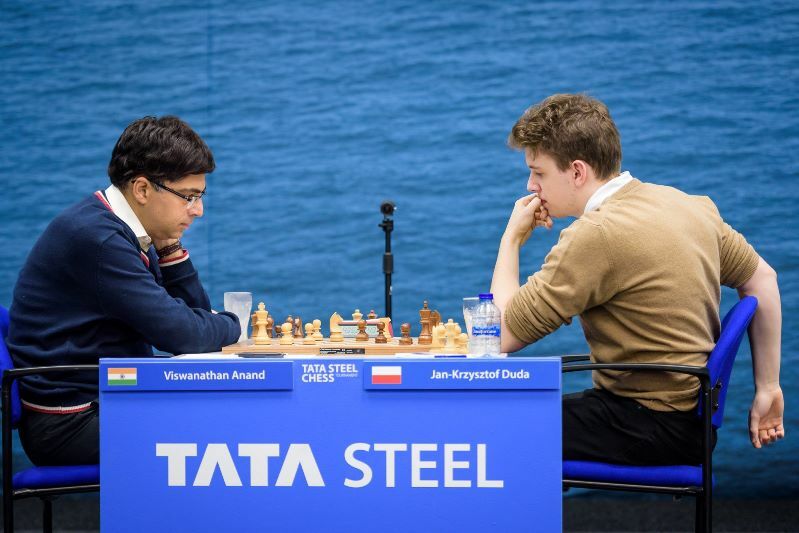 From there on White’s position was in tatters, and another blunder allowed Vidit to power to a 30-move win – a nice follow-up to crushing Kramnik the day before, and some revenge after losing all three games to Mamedyarov in the recent Tata Steel India Rapid & Blitz. 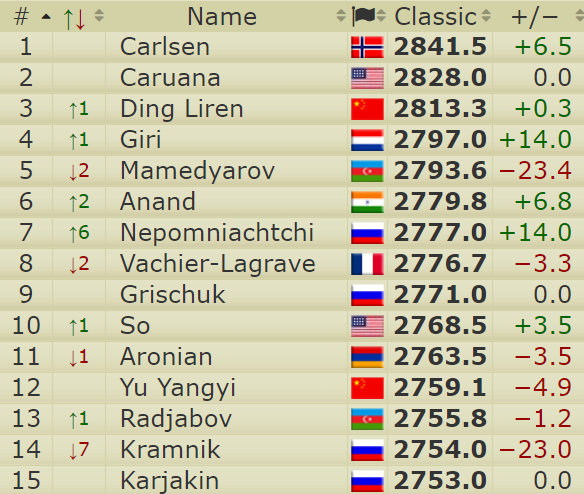 That result meant Vidit is comfortably back in the 2700 club (gaining 14.6 points in Wijk), but more significantly Mamedyarov has dropped out of the 2800 club, plummeting to 2793.6 and dropping below Giri (2797) to become the world no. 5. The biggest beneficiary of that outcome is Ding Liren, whose 16-move draw against Richard Rapport left him 20 points ahead of his closest rival in the race for the one 2020 Candidates Tournament place to be decided by rating. 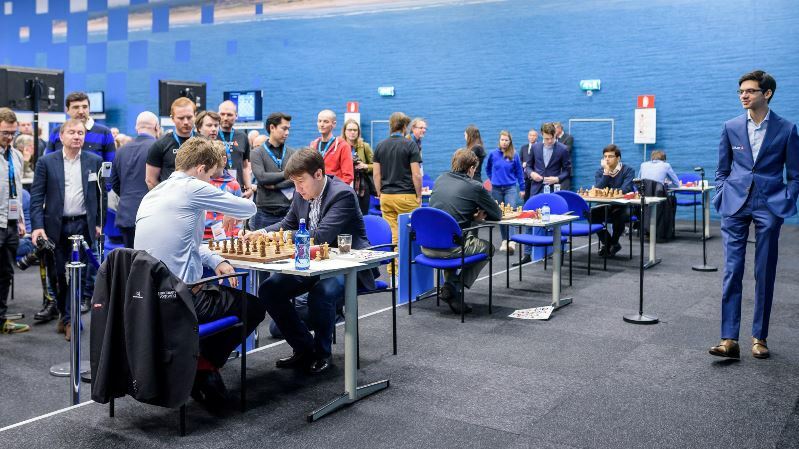 The remaining result was a 31-move draw in Anand-Duda, with Jan-Krzysztof Duda doing well to defuse his formidable opponent’s pressure in a Petroff Defence. She would have been winning after 28…Be6!, but instead, low on time, she forced a draw with 28…Rxg2 29.Kxg2 Qxe2+ 30.Kh1 Qf3+. If leaders Kovalev and Chigaev slip up, 16-year-old Andrey Esipenko is poised only half a point behind. 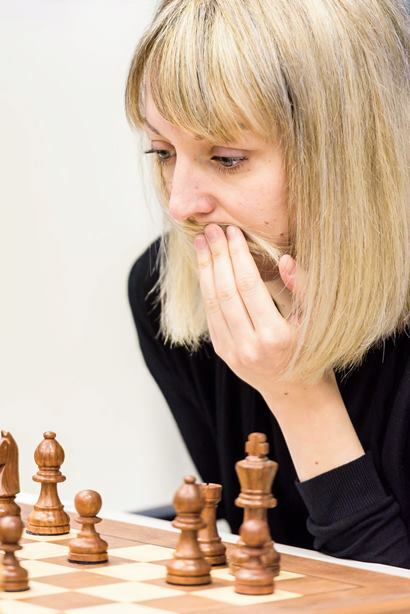 In Saturday’s penultimate round of the Masters all eyes will be on Carlsen-Duda and Radjabov-Giri, while Ding Liren-Anand and Shankland-Nepomniachtchi will also be crucial for the standings before the final round. 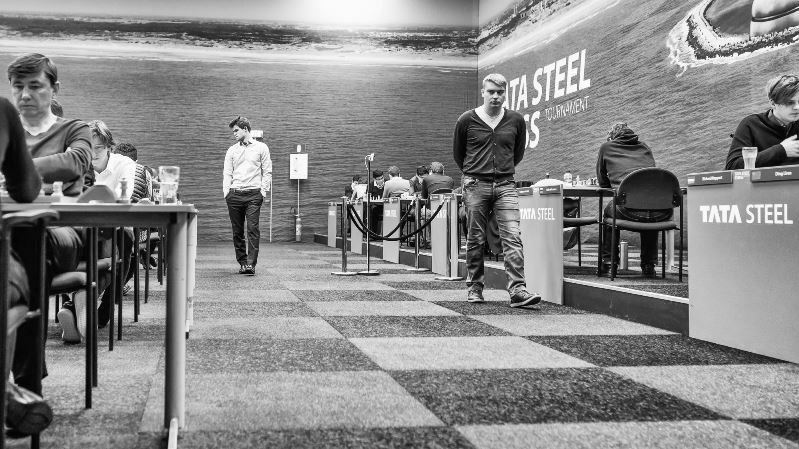 Tune in to live commentary with Jan Gustafsson and Peter Svidler from about 13:20 onwards!